Why Content Localization is important? Getting yourself prepared for the marketing plan before the end of 2017? Are you confused where to start from? Then it’s time to look for the key to your content marketing strategy…. This Year 2017, it witnessed increased competition in the market, according to the Market institute, 70% of B2B marketers surveyed say they are creating more content this year than they did in 2016. Content strategies help businesses plan for reliable and cost- effective sources of website traffic and new market opportunities. Thanks to technology that made life more easier and facilitated communication between companies and built more business opportunities. As a marketer, you have to focus on how to maintain a stable feet in the market, and gain more loyal customers and audience to your brand. 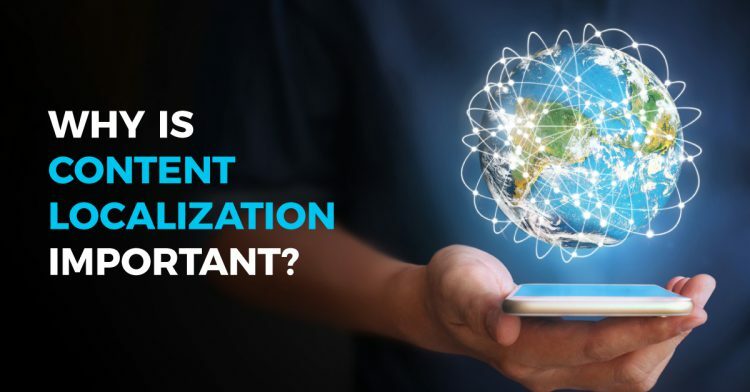 “Content Localization” can be one of the best strategies that could help you with developing your content marketing plan. It’s defined as creating content that reflects local language, knowledge, and different cultural norms and values of your intended audience. • Content development: use a simple, clear, precise text that delivers the message clearly without any misleading perceptions, try to make it attractive and matching to the users’ needs. • Language: you should make sure that your content reflects the language of your audience by avoiding any mistranslations, any different word spellings according to your targeted countries, like; British and American different spellings to certain words. Also putting into account your Software localization if you are introducing a new Mobile application software to your targeted audience. • Formatting and design: you’ve to design interactive, dynamic web pages, blogs, and brochures and interact with your users through any other sort of social media softwares to circulate information among the biggest number of users and attract more audience and gain more followers. Also the design of the web pages differ from one country to another, for ex: Western Countries will read from left to right, while Middle Eastern and East Asian countries will read from right to left. • Localization: work with Localization specialists and experts that are aware of their country of origin cultural differences and can help you to avoid any mistranslation or localization mistakes that could mislead your target audience, also use reliable translation memory systems and DO NOT depend on Google Translate as your professional translation services guide. • Cultural differences: it’s not only limited to different life styles, religious beliefs and food, and holiday ceremonies, but also it’s adapting your content to match the different users mentalities in your targeted country, so you also may consider while designing your marketing tools kit the visual components and colors in the design as they may be interpreted differently according to the culture of each country, as colors can convey different connotations, which if not taken into account might result in low traffic for your website, and also in low revenues for the new business opportunity you are trying to introduce to the new market. So existing in the market is easy, but what’s more important is to leave a legacy through developing your own content marketing strategy and having your own competitive content advantage. And that’s why Torjoman team are here to help you!